Will Wind Catcher Be Good for Arkansas Consumers? In early May, the Arkansas Public Service Commission concluded that an Oklahoma wind farm would be in the public interest of Arkansas. It is certainly trendy to support renewable energy sources. Solar and wind power projects are popping up across the country. But wind power has a lot of problems that Arkansas consumers should be aware of, even if the PSC thinks differently. This is surprisingly bold, considering that if that were really true, RES/RPS [renewable energy] mandates would not be necessary. For some reason, all calculations showing wind to be “low cost” conveniently ignore exorbitant subsidies, augmentation costs, power adjusting (see next item), additional transmission costs, and so on. Independent analyses of actual costs (e.g. here) have concluded that (when ALL applicable wind-related costs are accurately calculated) wind energy is MUCH more expensive than any conventional source we have. Consider just one part of a turbine, the generator, which uses considerable rare earth elements (2000± pounds per MW). 280,000 pounds of radioactive waste. Wind energy should be free compete with other sources of electricity. It should not be subsidized, however. Taxpayers should not be giving direct subsidies to wind companies and politicians should not be favoring this energy source through programs that mandate its use (something that drives up prices for ratepayers). 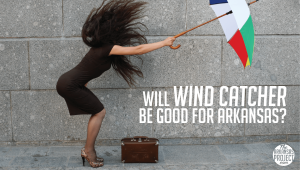 The PSC thinks that the Wind Catcher project will be good for Arkansans. The evidence suggests it will not. If this project is completed, we’ll see if the PSC is right.